A while back, I made this quilt just because I had some Whimsy charm packs and because I wanted to make a zig zag quilt based on this tutorial. I backed it with a super soft white minky-like fabric, perfect for cuddling, and ended up giving it my sister for her younger daughter, J., to use. The story goes that once my sister took it home, the older daughter, E., asserted her rights and immediately claimed it for her bed. Poor J. But the color scheme is really soothing and so I'm making another quilt using the same fabric line for my sister's Christmas gift. She chose the pattern I'm Blushing and now I just need to actually quilt the thing. Which likely won't happen until a couple of weeks before Christmas. 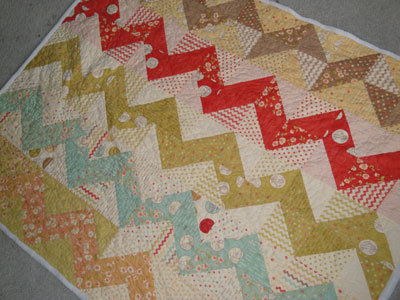 In the meantime, I've got at least a gazillion other quilt tops I want to piece before Christmas. I actually forgot that you had intended it for J, so completely has E asserted it for herself! YAY-- can't wait for the I'm Blushing quilt! Love the name of your Blog and am looking forward to your reading about your sewing adventures. You have so many wonderful passions!